Microsoft, in my experience cannot integrate with payment systems. Last year, it took me ages to renew my Windows Developer Account, why because the card on the system had expired and they wouldn’t let me put in another one, until I got the CVV number of the expired card!!! (Yeah, I carry around expired cards by the dozens)! Six months ago, I tried to renew my O365 license and I went around the loop multiple times before I was able to do it, but I couldn’t change my payment method. I have been planning to get a VisualStudio Online subscription primarily because the professional sub gives you a Visual Studio Pro license and a monthly payout of 45 GBP seems reasonable to move up from the Express editions I was using. 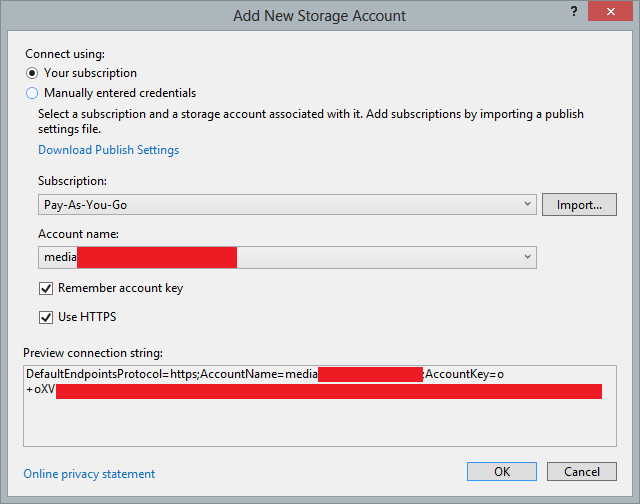 VisualStudioOnline subs are tied to Azure payment methods. My current one is tied to India. So I thought no worries I’ll create a new Payment method right? After all that’s all we do at Amazon right? WRONG! I couldn’t change the Country, it’s fixed to India. So any new payment method has to be from an India based card! I would have been okay if there are a payment mode in INR, but no, I’ve to pay USD/GBP conversion charges!!! Okay, so I cannot add a new payment method, let me add a new Subscription, surely that will solve the problem right? NO. After filling up all the details the country is still grayed out and set to India. Foxed, I go about looking for ‘where’ is this India actually selected? I look everywhere and I can’t find it. My outlook account that’s tied to Azure has been changed to UK and that’s what I see on the portal. So I opened a Ticket, hoping things can be resolved, but no I am WRONG there too. I got a response saying nothing could be done about the country and that I would have to create a new Live account with country UK and setup another Azure account using that? Wow brilliant! What happens when I go back to India again? Or if I move to US or Australia!!! Well as per Azure you should scrap your accounts as you go along, and request them to keep transferring the data!!! I really have no idea what it takes to build a payment system, but something tells me this is messed up! If Amazon (a book seller right?) can do it, surely the mighty Microsoft can do it, NO? Well, the story is developing… I let you know how it ends!!! Updated August 1, 2013: You can also control your Blob storage! 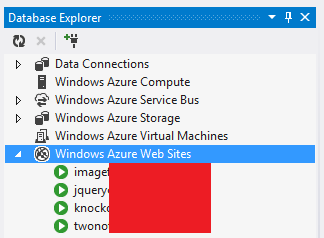 If you have Visual Studio 2012 Update 3 you can hookup your Visual Studio to manage Azure Web Sites remotely from inside Visual Studio. 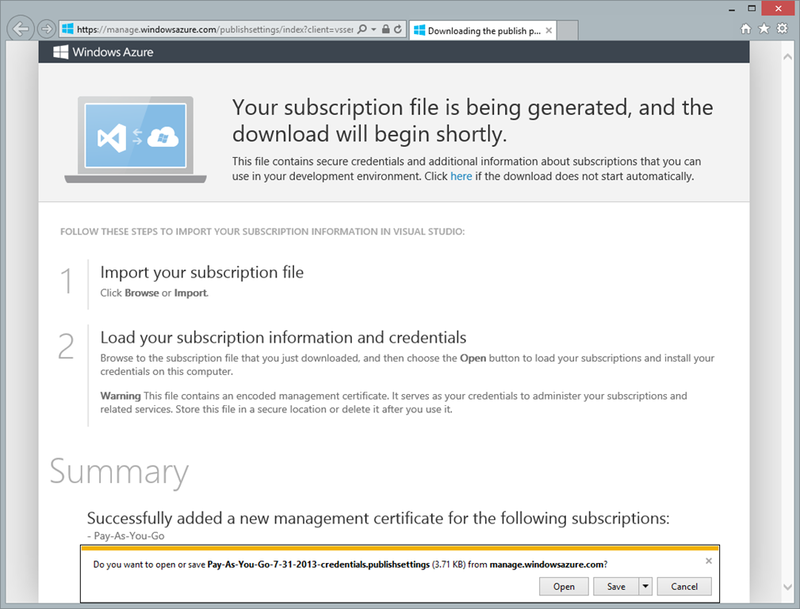 In the Import Windows Azure Subscriptions dialog click on Download subscription file. This will open up a browser and if you are logged in to Azure already will directly generate the subscription file and download it. If you are not logged in, you’ll have to log in first. Back in Visual Studio, select the downloaded file and hit Import. 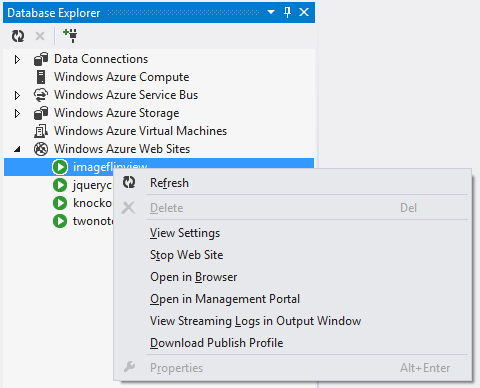 This will import the subscriptions and in the Database Explorer you can now expand the Azure Websites node and see all your deployed sites. You can right click on each site to get additional options like, Stopping/Starting, Downloading publishing settings, Viewing Streaming logs etc. Update: Not sure if this was in place already but I noticed it yesterday. 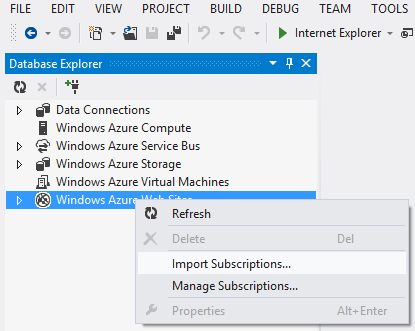 Once you have imported your subscription you can also use Azure Storage from Visual Studio. Two things that are really neat about Azure Storage integration is ability to create Blob Containers and Retrieving the Connection String directly. Both can be done from the (right click) context menu.